There are plenty of science-fiction shooters that put you in the cockpit of a nimble spaceship, and pit you against waves of enemy fighters. Orbital Decay, developed by Piron Games, adds a few new twists to shooter-defense genre, with great success. The resulting game is part shooter, part strategy game, part base-defense game, and all fun. The first thing that you’ll notice is that you’re not piloting a one-man spacecraft. Orbital Decay puts you at the helm of a massive drone-carrier class starship called “Radiant Star.” Your objective is to keep your vessel safe from waves attacking enemy spacecraft. Your gigantic ship takes up most of the screen, but (thankfully) you can scroll your view using the arrow keys. The turrets and bays on your vessel will function automatically, with one exception – a giant cannon called the “Ultragun.” While in combat, directly control this weapon, providing much needed fire-support. 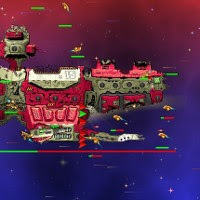 An individual enemy fighter doesn’t pose any real threat, but as the bad-guys start to swarm like mosquitoes, you may start to sweat a little. Shooting down foes will earn you credits, which can be spent via an upgrade interface. This interface is basically a blueprint of your ship, displaying 21 different “hardpoints” where you can install things like turrets, missile silos, and extra fighter bays. You can further upgrade these parts with attributes like increased range and shot power, or repair them if they are damaged. Simply put, this is an excellent game. While none of the gameplay mechanics are entirely original, they’re combined and presented in a way that manages to feel like a very fresh experience. If you like epic space battles, or are looking for some new twists on the shooter/defense genre, Orbital Decay isn’t likely to disappoint.